We’re living through a confusing time of budget-shifting and political games — and sometimes I wonder if people can even agree that 2 plus 2 equals 4. Last week, I wrote in the Kitsap Sun about two Bremerton public works projects — sewers in Gorst and a new Bremerton water-treatment plant. Together, they are using $13.5 million in federal stimulus funds. It has been said that the $7.5 million in stimulus money for the Gorst sewer project is a lifesaver for that community, because local residents never could have afforded sewers without it. Public officials have been trying for years to finance that project. Every time someone added up the costs, it looked like low-income residents would be hit with sewer assessments in excess of $20,000 each. Now the hookups will cost them nothing. Anyone driving into Bremerton from the south on Highway 3 knows this route. Look beyond the railroad tracks along the shoreline and think of the possibilities. I’ve always wondered if a trail could be developed there. Consider the benefits for hikers and bikers, including the folks who would like to bike to work. While I would never ride a bike on Navy Yard Highway as it is today, a separate trail away from the traffic is another story. I guess in one place — maybe less than a quarter mile — the trail would need to come between the highway and the railroad tracks, but it could be separated with a fence or some kind of barrier. There is no money for the trail, and engineering designs are still needed, but the group that came together last weekend put together some good ideas for the trail, shoreline restoration, stormwater management and public education. The next step is completion of a concept plan followed by a public meeting. 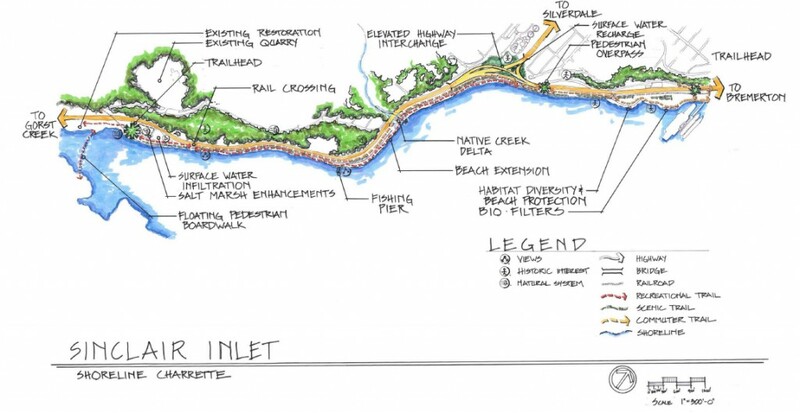 I don’t know if anybody remembers, but a shoreline trail around the Sinclair Inlet estuary (behind the buildings in Gorst) has already been designed and is ready to be built. (Read the story from Aug. 19, 2004.) State funds were available to build the trail as part of an estuary restoration, but money ran out during the restoration project, so the trail never got built. Maybe it’s time to dust off these trail plans and get this project going — with volunteers if necessary. I don’t believe there are any permitting obstacles to be overcome. It just needs to be built. 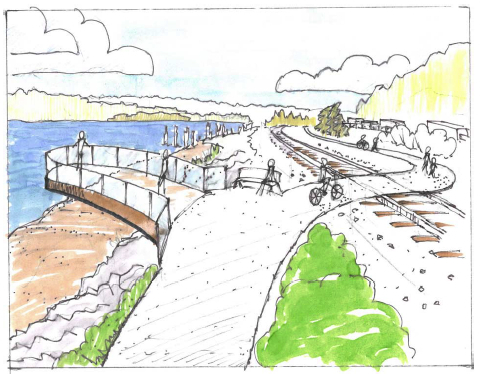 The Gorst trail, including boardwalks through wet areas, could link up with the future trail that will take you all the way into Bremerton.